Ole Miss and Southern Illinois battled for control in their competitive matchup Saturday afternoon, which resulted in a 76-41 blowout victory for the Rebels. 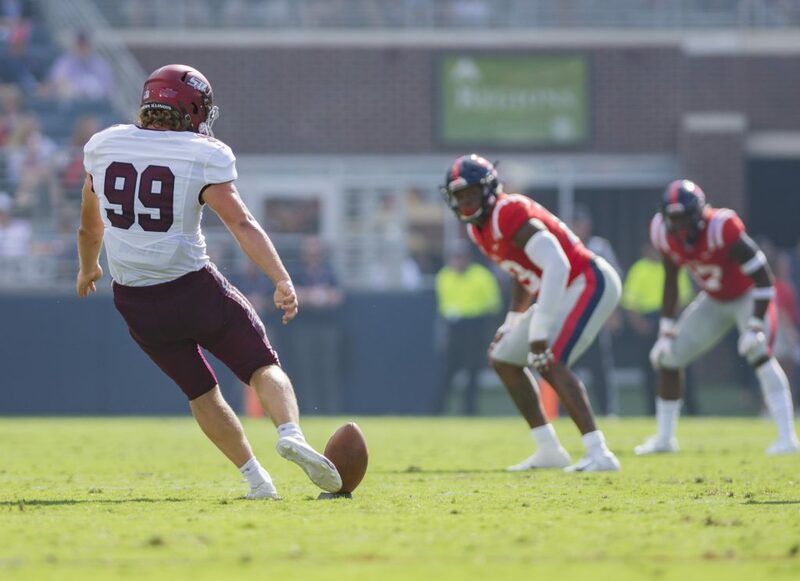 At halftime it seemed the Salukis could cash in on a 3-point lead and steal a win, but a 41-3 Rebel run during the second half ensured a comfortable victory. The result of this game is less important than what it means for next week’s contest against stout Alabama. Nick Saban will be pleased with what he sees on film. This weekend, both Ole Miss and Alabama played inferior opponents ahead of their week-three competition. The goal for both was to use this week as a tune-up before SEC play commenced. The Crimson Tide handily beat Arkansas State, 57-7. It was a different story for Ole Miss. The Salukis’ 38 points in the first half were the most ever in a half by an FCS opponent playing an FBS team. SIU scored on every drive of the half, using play-action passes to create big plays. One drive included two third-down conversions of ten yards or more. The Ole Miss defense found any and every way to give up yards to a team that threw for a total of 107 yards a week ago. Tua Tagovailoa and the Tide should be licking their chops. D.K. Metcalf and A.J. Brown were their usual dominant selves on Saturday. Though DaMarkus Lodge was out with a concussion, the depth of the wide receiver room shined. Former 4-star recruit and true freshman Elijah Moore introduced himself to the Rebel faithful with a 50-yard score on his first career catch. Braylon Sanders followed up a Metcalf 51-yard catch with a contested 30-yard touchdown right at the pylon. Matt Corral will have plenty of weapons to work with when the top three options move on. Brown, Metcalf continue to be the top wide receiver duo in the country. The talent between Ole Miss’ top players is apparent, week-in and week-out. The wide outs make plays at every level of the field. If it is catching a bubble screen or going deep down the field, Brown and Metcalf have the chance to score. 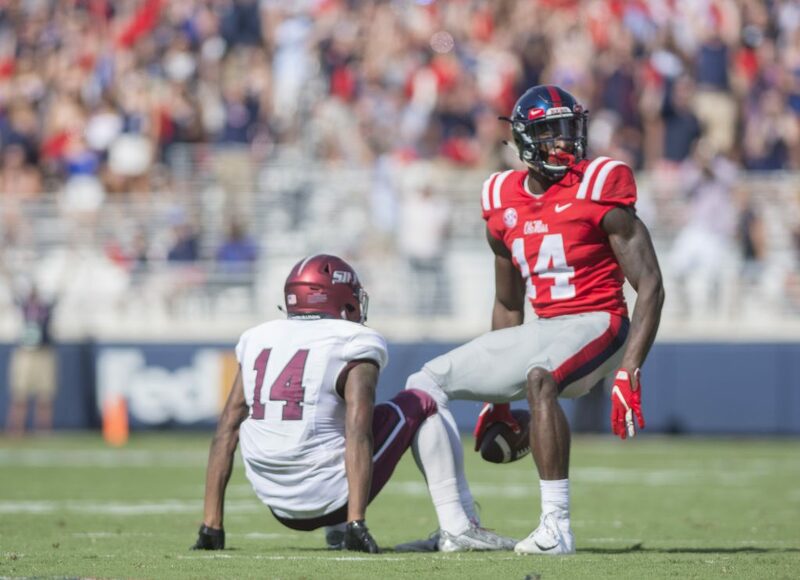 Metcalf’s height and strength pose problems for any defensive back in the country. His third-quarter touchdown grab was another example of this. He skied over the defender and tapped his toes down to complete the catch. Between him and Metcalf, the two combined for 15 catches, 261 yards and three touchdowns. Ta’amu needs a performance like this next week to compete with the Tide. Scottie Phillips is a problem. Jordan Wilkins was the first Ole Miss running back to eclipse 1,000 yards in a season for some time a season ago. Junior college transfer Scottie Phillips is 689 yards away from joining him, after only two games. Phil Longo’s offense depends on a competent rushing attack to balance out the passing game. 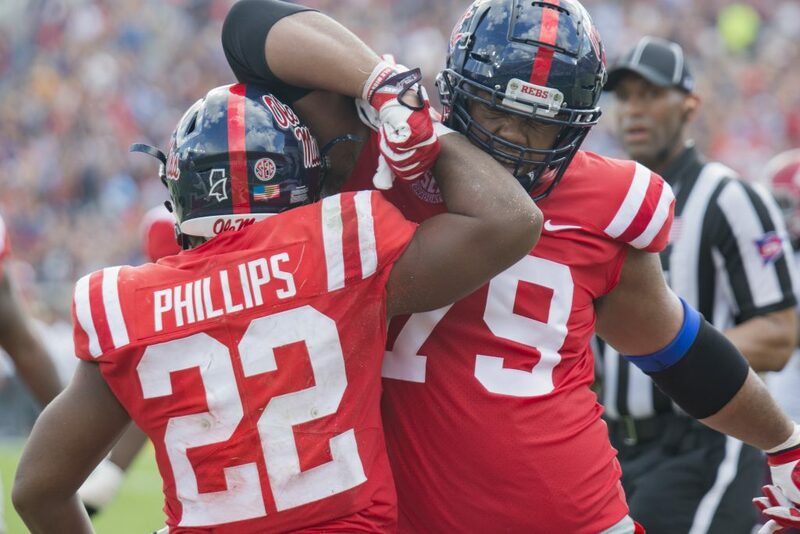 Phillips is averaging 156 yards and two touchdowns per game as a Rebel. He has the skill set and potential to be one of the best backs the school has ever seen. Jordan Ta’amu is a legitimate candidate for the Heisman Trophy. It is time for the rest of the country to get familiar with Jordan Ta’amu. He has racked up 784 yards passing and seven touchdowns through the first two games of this season. The mixture of a high-octane offensive scheme, highly talented playmakers and top-notch football intelligence is the perfect storm for great production. The numbers will not slow down when SEC play starts. Ta’amu’s production is here to stay.